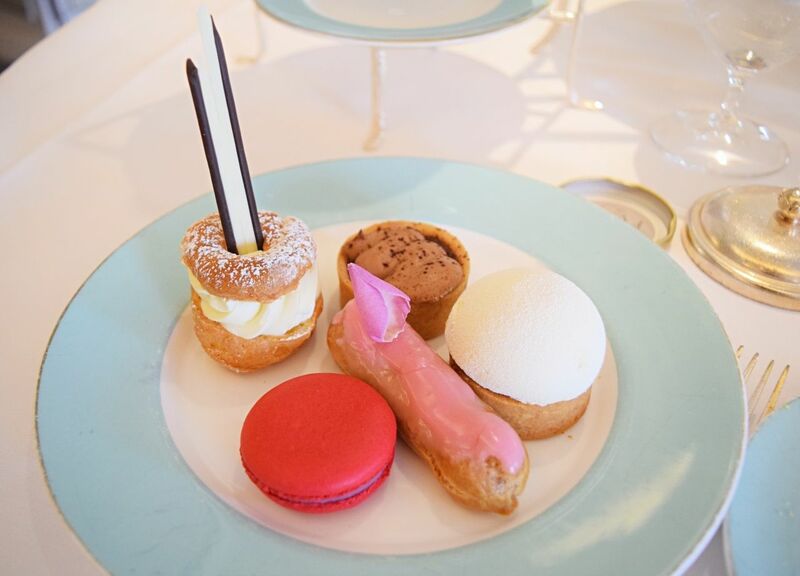 If you haven’t gathered by now from reading my blog, having afternoon tea in London is one of my favourite things to do. 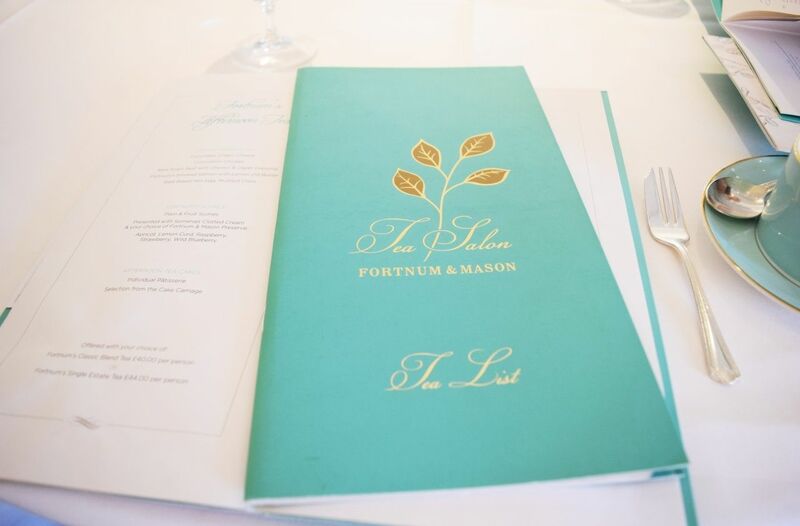 I still have a list of places I would like to visit but one on the list is Fortnum & Mason and thanks to the lovely people at Zomato I was able to tick this off my list last Friday. My dad had come to London to visit me for a few days and so he was the perfect tea partner. 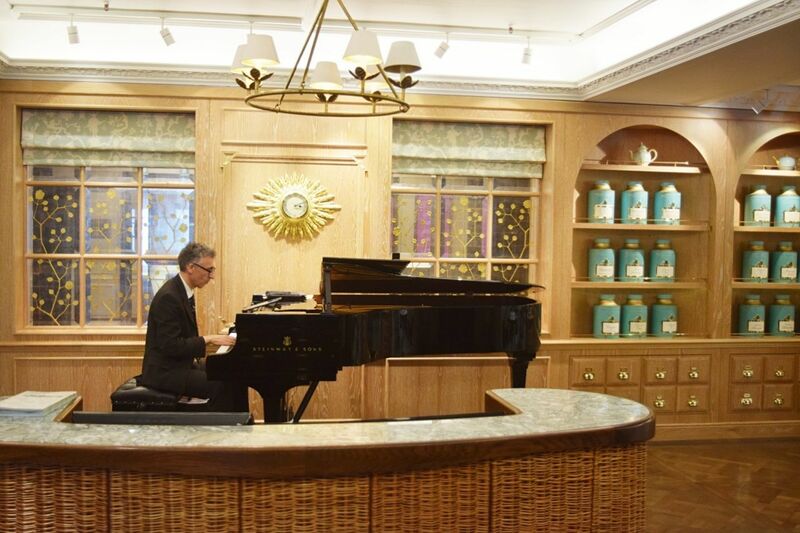 Everytime he visits London he always likes to go Fortnum & Mason so I thought it would be the ideal way to treat him. 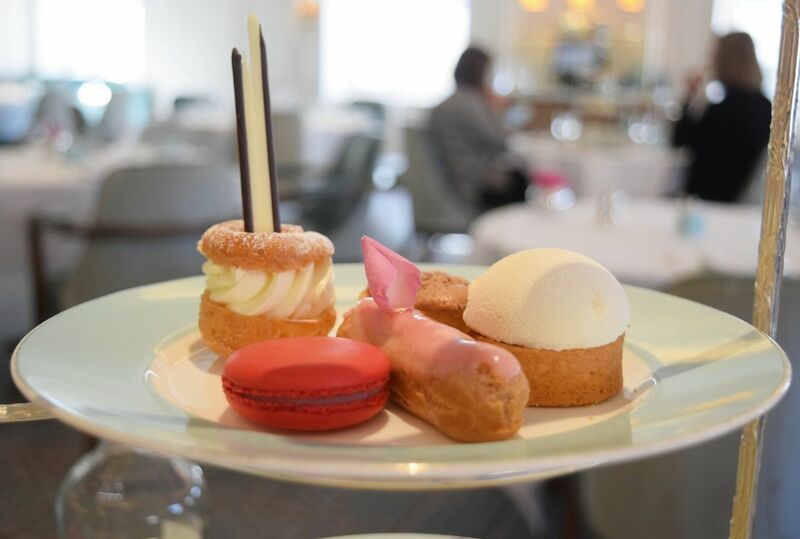 Afternoon Tea takes place in the Diamond Jubilee Salon on the fourth floor, as you walk in the pianist plays on the piano and you definitely feel like you have gone back in time slightly. We were taken to our seats after a short wait in reception, I was able to check my coat and then get a head start on browsing the menu. 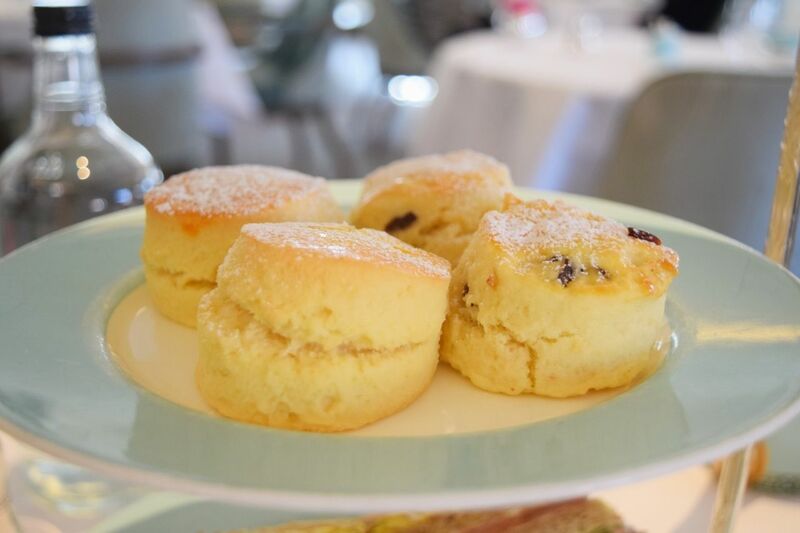 The Diamond Jubilee Salon is a lovely area to enjoy afternoon tea. It has big windows that let in so much light and if you have a window seat you can look out onto Piccadilly. My favourite part of the afternoon tea apart from the food was the china, it was just so lovely! 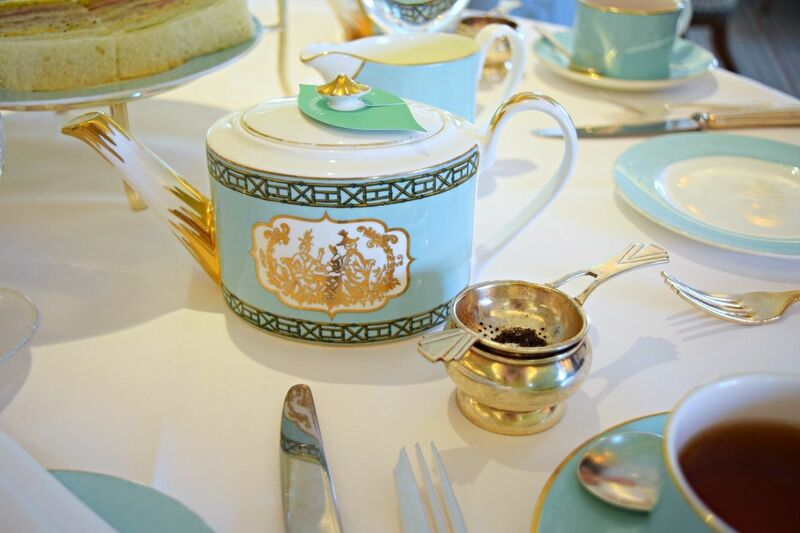 I loved the traditional Fortnum & Mason turquoise coloured teacups and teapots. 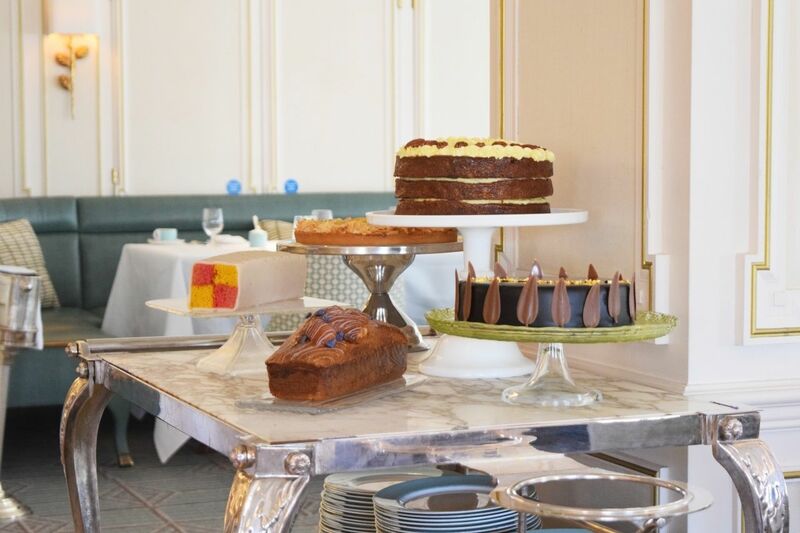 We both decided to have the standard afternoon tea, but at Fortnum’s there are three options. A high-tea which starts with more of a main meal and also a savoury tea, where you can opt for all savoury options. I of course love cake so it was an obvious choice for me to stick to the traditional afternoon tea. The tea selection is fantastic, there are plenty classic blends to choose from including more flavoured teas, which are my favourite. Then also the choice of herbal tea and coffee options too if tea isn’t your thing. I chose the black tea with strawberry and my dad started off with the Queen Anne Blend to then later alter to the Royal Blend which was slightly stronger. They were happy for you to try teas out and if you didn’t like what you chose, then it was really simple to switch. I was however really happy with the strawberry black tea, it just had the right amount of fruity flavour without being too sweet. After our tea the food arrived so quickly, I was really impressed as normally you have to wait quite a bit while they prepare it. 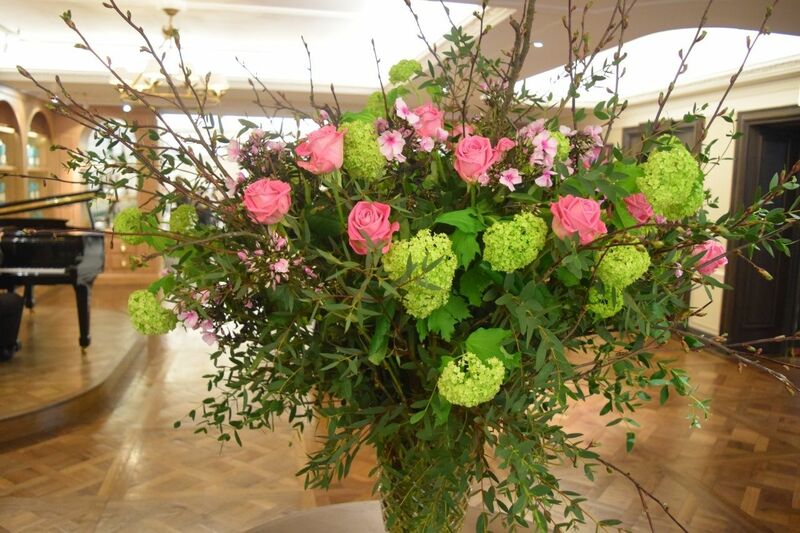 There was a selection of finger sandwiches which included; cucumber and mint butter, coronation chicken, rare breed hen egg with mustard cress, Fortnum’s smoked salmon with lemon dill butter and also a rare roast beef with gherkin and caper dressing. I’m not a salmon fan so my dad was loving eating all those ones, whereas my favourite was the rare beef it was delicious. The scones were lovely, although I must admit not piping hot. I really love a hot scone when the butter melts on it. They were slightly smaller which I do like as it saves much more room for the cakes. They came with two jams, blueberry and strawberry and a big pot of clotted cream. Onto the cakes, these were a selection that I can’t truly remember what each was. The snowball looking one was a biscuit type base and had a marshmallow top and cherry type filling, it really was very tasty. Then there was the pink iced eclair filled with cream, a chocolate/coffee tart – I am not a fan of coffee so gave this one a miss and a macaroon which was really, really nice and then the last one with two spikes of chocolate coming from it, it was filled with cream and I think lemon, but don’t hold me to that! We were offered plenty more cakes or sandwiches when the plate was empty which is definitely a bonus. A few more cups of tea later I was so full and couldn’t quite manage the trolley full of extra cakes. These looked amazing and so the waiter kindly offered if I wanted to take some home, which was met with a resounding yes and so I took home a piece of the spiced apple cake, which was wrapped in a beautiful ribboned doggy bag. 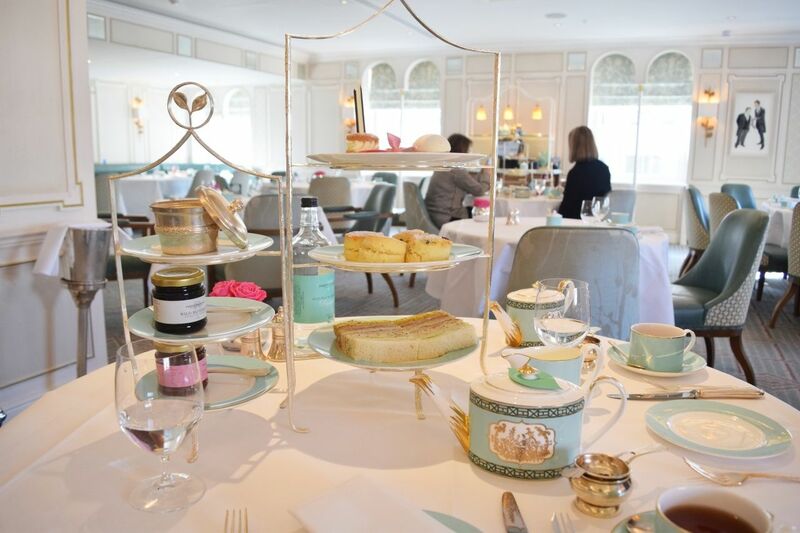 We both had a fabulous afternoon tea at Fortnum & Mason, the tea and food was perfect, the setting lovely and we even had a celebrity spot of Joanna Lumley joining us in the Diamond Jubilee. 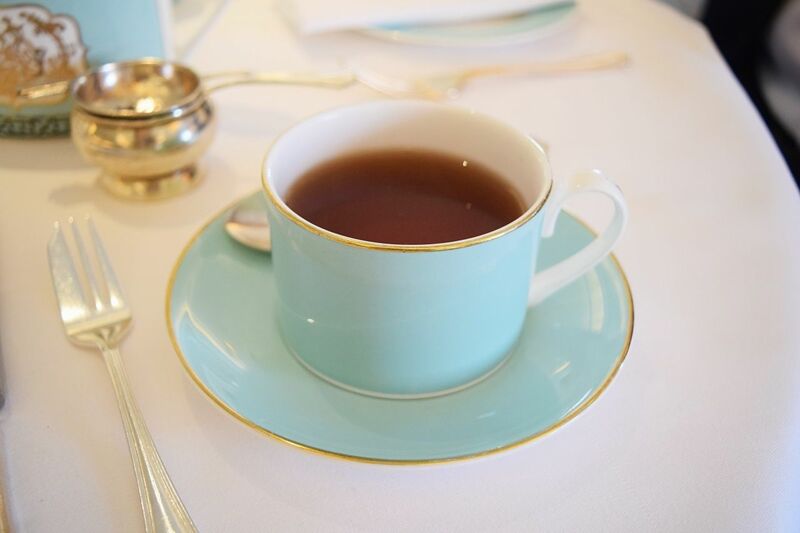 Afternoon Tea at Fortnum’s is priced at £40 per person with a classic blend tea or £44 per person with a single estate tea. For more info or to book visit Zomato. 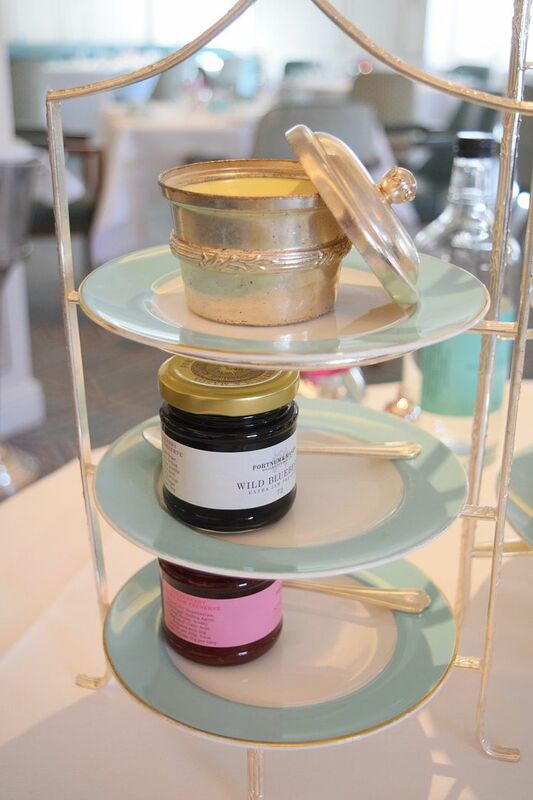 Your afternoon tea experience looks absolutely wonderful! I am trying to decide on an afternoon tea place to go while visiting London early next month. Would you recommend this place the most? Or do you have another favorite you can recommend? 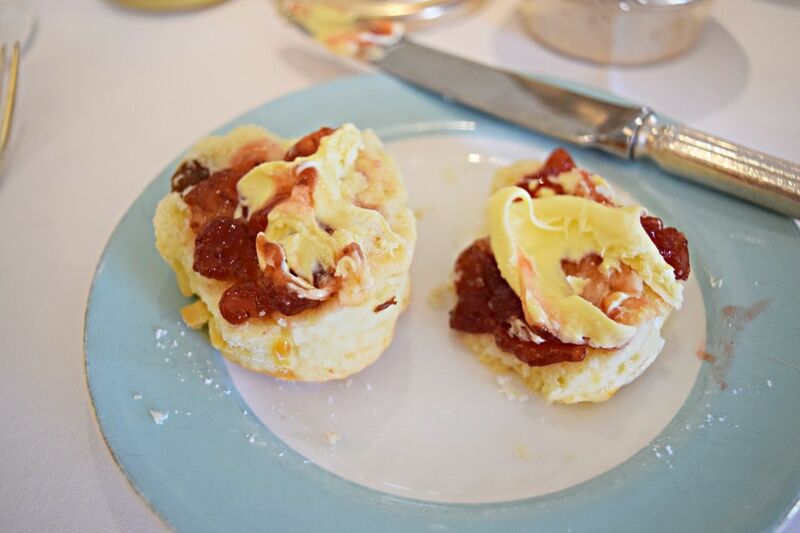 I am looking for traditional British afternoon tea with the best scones that come with clotted cream! I’m going to be visiting from California and I’ve dreamed of having a good afternoon tea in London. If you can offer any insight, I would greatly appreciate it! Hi Paula! Thank you so much for responding back! I took your advice and made a reservation! 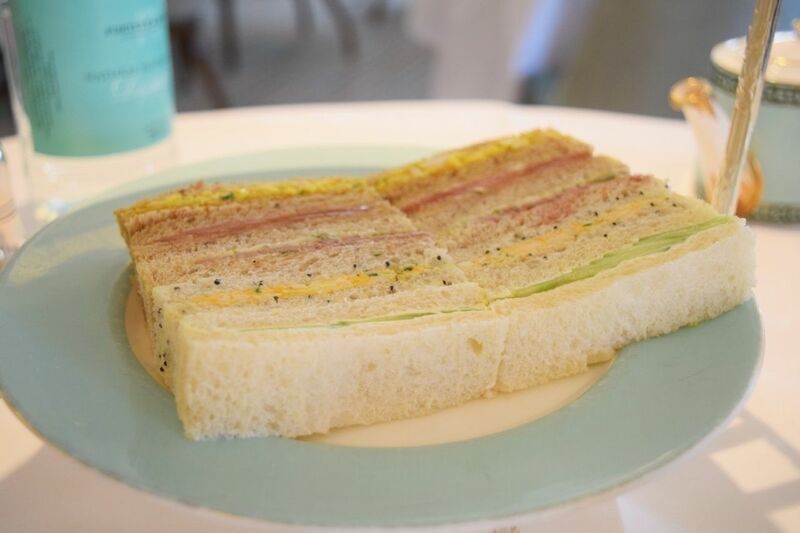 Am I understanding this correctly, that the tea service at Fortnum and Mason allows you to have unlimited servings of their sandwiches? If so, that is amazing! You’ll have a great time! Yes that’s correct, I’m not sure how unlimited it goes lol but if we wanted any more they would bring them! The tea selection is amazing too, so many flavours! That’s amazing! Okay great, I will have to let my friend who is joining me know. It’s our first time in London and we are also looking for a pub and bar to go to. Do you happen to have any recommendations for two American girls to go to? Are you looking for more of a cocktail bar or a more traditional pub type? Of course you have to have the London experience! Whereabouts in America are you? For cocktail bars again so many but I have listed a few of my favourites with different price ranges. London Cocktail Club – this is a really fun cocktail bar, their cocktails go on fire (well some of them!) ha! It can get quite busy as it’s small, my favourite is the Goodge Street branch, best to reserve a table. Mark Hix Bar in Soho – I LOVE this bar, be careful of the Zombie cocktails they are strong hehe. A great one for after dinner. I recommend having dinner at MASH Steak across the road, amazing steaks! Crazy Bear – Just up from London Cocktail Club, this one is a bit more expensive but the cocktail selection is amazing. The Sanderson Hotel – A pricey one, but a great bar. 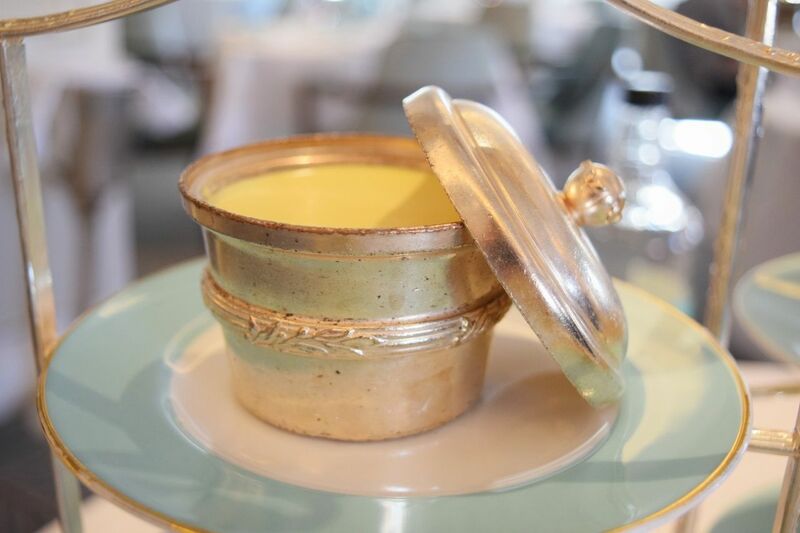 The Langham Hotel – another pricey one but cocktails are very cool. Thank you for the wonderful recommendations! I will check them out and see which one we can go to! We are from Southern California! 🙂 I just met with my friend earlier this week and we are compiling a list of things to do in London! So much to see so hopefully we can fit it all in! Thanks again for replying back to me and giving me some very useful information! Not a problem! One thing I would recommend to do is the Skygarden, amazing views over London and for free. I would recommend this over The Shard. Thank you so much for the Skygarden recommendation! I was able to get a ticket for the Sunday night we are there! Do you know if they kick you out at certain time? Did you have a reservation at the bar to grab those cocktails? Or can you just show up and purchase a drink and find a place to sit? Also we were definitely planning to visit Borough Market so I am glad you posted your blog link there! I loved seeing all the photos 🙂 Your blog is amazing and it’s been super helpful giving me tips on what to do while I’m there! Thank you! Yeah you can just show up and if there is a table free you can just take it. You can stay as long as you want, no set time, pretty much until it closes I’m guessing. They also have two restaurants, but you have to book those.